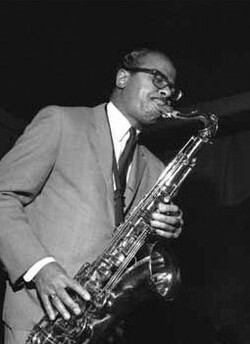 Like many young jazz musicians in the early 1950s, Benny Golson came up through the rhythm-and-blues bands of the period. But while many musicians disappeared into the world of jump boogie, Benny retained his jazz vision and sensibilities. The problem with r&b for a saxophonist of Benny's creative caliber was that a band's horns didn't have much to do other than add texture here and there, and emphasize the all-important beat. Improvisation beyond the blues, for the most part, was out. So while r&b paid the bills, Benny composed, played jazz clubs and remained in close touch with his jazz peers from Philadelphia. 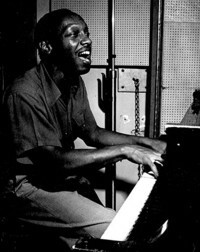 Fortunately for Benny, jazz artists such as pianist-arranger Tadd Dameron [pictured], bassist Jymie Merritt, pianist Freddy Redd, drummer Philly Joe Jones, saxophonist Charlie Rouse and many others also were playing with r&b bands. Even Benny's childhood friend John Coltrane paid his r&b dues. JazzWax: Was it tough attending Howard University rather than play jazz right away as a professional musician? Benny Golson: No, no, no. My mother worked her fingers to the bone, and my father sent me money each week to help me get by. College wasn't as expensive as it is now. 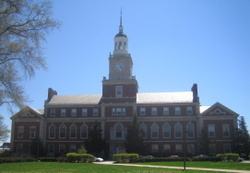 Back then I wanted to study music at Howard [pictured] to learn the basics. But I was disappointed at school because there were so many music rules. So many of the lessons I was taught contradicted the ideas I had in my head. 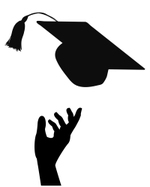 JW: What did you do when you graduated from Howard in 1950? BG: I began playing professionally right away. One of my early jobs was with guitarist Tiny Grimes [pictured]. 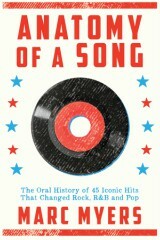 Ray Bryant, who also grew up in Philadelphia, brought me in. Tiny had played with Art Tatum in the mid-1940s, so he was something of a legend. Art Tatum played in any key that struck his fancy. Tiny was the same way. When I played with Tiny, I thought I was going crazy. 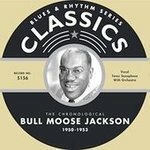 JW: In 1951, you joined Reginald Benjamin “Bull Moose” Jackson, an r&b band. Big change? BG: Oh yes. Tadd Dameron played piano in that band and provided me with so much inspiration. Tadd was an anachronism in that band. He and Bull Moose [pictured] had grown up in Cleveland together. Tadd wasn't working at the time, and Bull Moose needed a piano player. He said to Tadd, “Look, if you're not working, come on and make a few gigs with me, and you'll get to earn some money. You can always leave when you choose.” So Tadd joined. JW: Working with Tadd must have been great. BG: When I joined, Tadd liked the way I played. 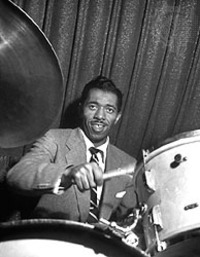 I was able to get drummer Philly Joe Jones [pictured] in the band. Philly was a great rhythm-and-blues player. Not many people know that. I also brought in Johnny Coles and Jymie Merritt. We played Bull Moose's stuff to make the hits and the money. And the band played Tadd's jazz arrangements, too. 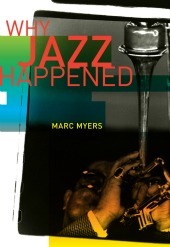 Eventually we had two audiences—a jazz audience and the r&b audience. And then I started to write. JW: What did Tadd think of your arrangements? BG: He was so proud of me. He came over one night, really tongue in cheek, with that voice of his, and said, “What a drag. We played one of your arrangements and people came over and told me they loved my arrangement. What a drag.” Tadd [pictured] was so proud of me because I was picking up. But I didn't just stick to him as an influence. I added to what he taught me and tried to develop my own thing. JW: But Tadd was a major influence, yes? BG: Whatever progress I made is owed to Tadd. He was so melodic and a great mentor. Tadd [pictured] said to me, “The next time I go to Europe I'm taking you with me.” But he never went. Mind you, how I played the tenor sax back then wasn't the way I played later or now. When I look back on those days, my playing style wasn't that great. It was too smooth and silky. Art Blakey taught me to put bite in the stuff. 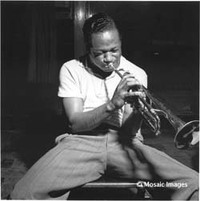 JW: In June 1953, you recorded with Clifford Brown, Gigi Gryce, Tadd and an all-star group. What did that experience teach you? BG: You know what happens when you take two knives and scrape them together so they both get sharp? That's how it was with me and Brownie [pictured]. What I didn't know Clifford knew. And what Clifford didn't know I knew. Playing together for the whole summer was something else. When we played gigs, Philly Joe was on drums, Jymie Merritt was on bass, Cecil Payne was on baritone sax for a minute, Gigi was on alto, and Clifford and Johnny Coles were on trumpets. JW: What was the recording session like? 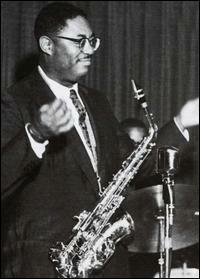 JW: In 1954-56, you were recording with alto saxophonist Earl Bostic's band. BG: Yes, until he fired me. It was the only time I was fired from a band. I deserved that firing. Bostic was the best technician on the alto sax I had ever heard. Charlie Parker couldn't touch him, not on technique. Style was a different matter, of course. 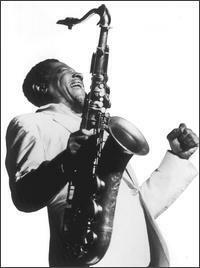 John Coltrane and Stan Turrentine worked with Bostic before I did. John told me about his technique. Bostic was like a demon, that guy. He would play the things that made him money, like Flamingo, ad nauseam. The rest of the group would play a chord or a triad at the end and just stand there most of the time. There was nothing for us to play. JW: Why did you get fired? BG: For a series of things. The first happened down South. 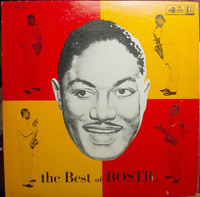 In addition to being a saxophonist, Bostic played guitar. Whenever he'd pull out that guitar, I said to myself, “Man this is driving me crazy.” That's because the rest of the band would have virtually nothing to do. So one time when we took a half-hour intermission at a dance, I sneaked back up onto the bandstand and tightened some of the strings and loosened others. When we went back on stage, Bostic didn't bother tuning up because his guitar was already in tune. He'd kick off the song, start playing and the guitar was crazy and all out of tune. He couldn't figure out what was wrong with the instrument. He kept looking at it. Then the guys started laughing and looking at me. So he knew. JW: What was the final straw? BG: Nobody had ever sat in with the Earl Bostic band. He wouldn't let them. 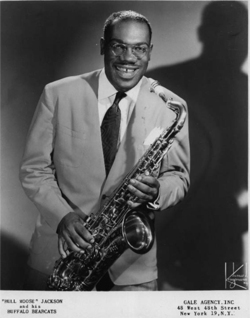 When we were on the road in Seattle, Walter Benton [pictured], a tenor saxophonist and good friend of mine, came by and had his horn with him. He asked if he could sit in. I said, “Sure.” [laughs] When Bostic finished his solo and opened his eyes, this stranger stepped up to the mike and started playing. Bostic said, "Who the heck is that?" When Walter finished his solo, Bostic asked Walter what he thought he was doing. Walter said, “Benny told me I could play.” That's when I got fired. Bostic gave me my two weeks. Tomorrow, Benny talks in Part 3 about the origin of Stablemates, how Miles Davis came to record the song in 1955, how the recording changed Benny's career, what made childhood friend John Coltrane special, and the words Benny said to Dizzy Gillespie in 1956 that he wished he could have taken back. 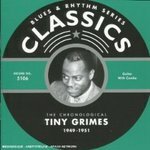 JazzWax tracks: Benny Golson's recording dates with Tiny Grimes are captured on Tiny Grimes 1949-1951 here. Benny recorded two sides with Bull Moose Jackson in 1951—I'll Be Home for Christmas and I Never Loved Anyone But You. Both are on Bull Moose Jackson 1950-1953 here. 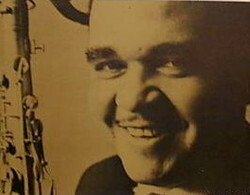 In June 1953, Benny appeared on his most important jazz record session to date. 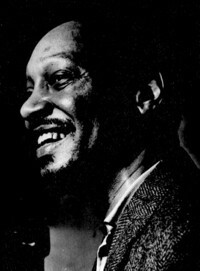 Playing tenor sax, he joined Clifford Brown and Idrees Sulieman (trumpets), Herb Mullins (trombone), Gigi Gryce (alto sax), Oscar Estelle (baritone sax), Tadd Dameron (piano), Percy Heath (bass) and Philly Joe Jones (drums). 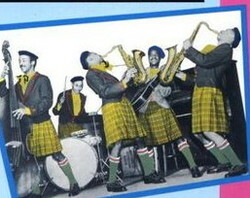 The group recorded four tracks. Arranged by Dameron, they were Philly Joe Jones, Choose Now, Dial "B" for Beauty and Theme of No Repeat. 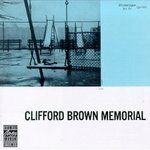 The tracks are available as a download at Amazon here on Clifford Brown Memorial. This was Tadd Dameron's Big Ten group and a seminal session that established the groundwork for hard bop. 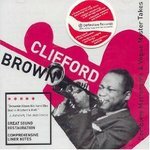 If you want the CD, the tracks are on Clifford Brown: Complete Metronome & Vogue Master Takes here. It's going for about $23 used or $31 new. If you don't own this double-CD set, just buy it. Trust me, it's groundbreaking music, and once this CD is out of print, you'll be sorry you didn't snap it up when you could.